That hasn’t stopped the rush to market, however. Despite the dearth of evidence, in regards to both safety and efficacy, stem cells are currently used in veterinary practices and can be found in an array of over-the-counter supplements. Some worry the hype is overshadowing the science. Although stem cell therapy is in its infancy, research on adult stem cells has been ongoing for decades. In the 1950s, scientists discovered that bone marrow contains at least two kinds of stem cells: hematopoietic (blood forming) stem cells and mesenchymal, non-hematopoietic stem cells. Some 60 odd years of study later, bone marrow transplant is the only stem cell therapy currently being used in mainstream medicine. People with leukemia are treated with hematopoietic stem cells from a healthy donor after radiation. Other types of non-hematopoietic stem cells have since been discovered, but none yet have the proven safety and efficacy to move beyond experimental use. Of the domestic animals, horses have been the primary focus of research on stem cells. But whether that work can be called stem cell therapy in the technical sense remains to be seen. “This is where it becomes difficult to explain to people because I don’t think anything in the horse to date is true stem cell therapy. The cells that are being applied haven’t been proven to be true stem cells. They may still have an effect, but they don’t fulfill the definition of stem cells,” said Dr. Koch. To understand stem cells, we must start at the beginning: the moment of conception. When an egg and sperm join they form a single cell known as a zygote. Almost immediately, the zygote begins to divide, forming two, four, eight, sixteen cells, etc. These cells are stem cells and have the remarkable potential to develop into all different cell types in the body. The cells formed in an embryo are just one type of stem cell. Many different types come from different places in the body or are formed at different times in our lives. Embryonic stem cells exist only at the earliest stages of development. Various types of “tissue-specific” or “adult” stem cells appear during fetal development and remain in our bodies throughout life. Skin, muscle, intestine and bone marrow, for example, each contain their own stem cells, which can give rise to a limited number of mature cell types, usually corresponding to the tissues in which they reside. Recently, scientists have also learned how to engineer stem cells. Known as induced pluripotent stem cells (iPSCs), these cells are produced in a laboratory by reprogramming mature cells, such as skin cells or immune cells, to create an embryonic-type stem cell. This breakthrough is transforming stem cell research as we know it, but we’ll talk more about that in a minute. The important thing to remember is that, regardless of the source, all stem cells share two characteristics – they have the ability to self-renew and the capacity to differentiate. In horses, researchers are currently working with three types of stem cells: embryonic stem cells, mesenchymal stem cells and induced pluripotent stem cells (iPSCs). Each offers different advantages and disadvantages and will have varying degrees of potency, depending from where they are derived. “A fetal or embryonic stem cell has the most potency to become whatever. Next would be an umbilical cord stem cell because it is still so fresh. If you get it from the bone marrow, it’s still good, but it’s nowhere as powerful as when it is an embryonic stem cell,” said Dr. Judith Koenig, an Associate Professor of Large Animal Surgery at the University of Guelph and frequent collaborator with Dr. Koch. Embryonic stem cells are derived from very early stage embryos and can, in theory, give rise to all cell types in the body. Their use, however, is highly controversial. “The ethical controversy about embryonic stem cells is that you are sacrificing an embryo to make those cell lines,” explained Dr. Koch. “What’s often not discussed in that debate is that there has never been an embryo produced for the purpose of making embryonic stem cells. All embryonic stem cells have been produced from embryos that were a waste product of an in vitro fertilization clinic – these embryos would have been thrown out if they were not used for this research.” The real debate, he said, should be on in vitro fertilization and the creation of these embryos; not how they are used once created. Ethical issues aside, there are risks and technical challenges related to embryonic stem cells that make them less appealing from a research perspective. Chief among these is the risk of cancer. “There is always a worry when we go back to embryonic stem cells because there is a link between stem cells and cancer, although we have no case of a tumour happening in the horse and they are widely used,” said Dr. Shelia Laverty, a Professor and Clinical Surgeon at the University of Montreal. Dr. Laverty is one of two veterinarians who were invited to join the prestigious Canadian Arthritis Network. What’s more, embryonic stem cells are difficult to work with. Coaxing these stem cells into a particular cell type in the laboratory is not easily done and, as of yet, no one has isolated a true embryonic stem cell in the horse. For these reasons, there are currently no treatments using embryonic stem cells accepted by the medical community. The less controversial choice, mesenchymal stem cells are commonly used in both treatment and research in veterinary medicine. These cells can be derived from bone marrow and fat (mesenchymal) and from umbilical cord blood (mesenchymal stromal). Both can generate bone, cartilage and fat. “Within the horse, the most published work and peer-reviewed work has been on the bone marrow-derived cells,” said Dr. Koch. Cord bloodderived stem cells, in comparison, are newer and less studied, but offer a few distinct advantages. First isolated by Dr. Koch, these cells can be collected non-invasively at the time of birth with no risk to the mare or foal and, as importantly, they allow researchers the luxury of lab time. “Cord blood stem cells are cryo-tolerant, meaning they can be frozen and stored for years in liquid nitrogen, so you can bank these cells and store them long-term for the life of the horse,” said Dr. Koch. In 2011, Dr. Andras Nagy, a Senior Investigator at Mount Sinai Hospital’s Samuel Lunenfeld Research Institute in Toronto, and Dr. Lawrence Smith, a Professor at the University of Montreal, Faculty of Veterinary Medicine, reported on these cells in the horse for the first time. Unlike the embryonic stem-like cells derived by researchers previously in horses, these manufactured stem cells are able to form all cell types of the body. “In principle, if you are diabetic, we could potentially take a differentiated somatic cell from you like a skin cell, reprogram it into an insulin producing cell and give it back to your pancreas, and you don’t need to inject yourself with insulin anymore,” explained Dr. Koch. As with embryonic stem cells, however, safety remains a concern. “Because of the cancer link, when you go back to these induced pluripotent stem cells there is always that worry,” said Dr. Laverty. We know stem cells are likely to aid in healing. The big question is: how do they work? That mystery science has yet to solve. “Traditionally, people thought if you have a stem cell then you can make a different tissue with that stem cell and then replace injured tissue. That notion has been challenged a little bit,” said Dr. Koch. What stem cells produce is now receiving equal attention to what they may be able to become. The current thought is that they may contribute to healing by secreting molecules that attract and activate other cells at the injury site. One possibility, said Dr. Koch, is that the cells need to be pre-conditioned to build tissue before use. “If we want to treat cartilage maybe we need to stimulate the cells in the lab to become cartilage cells before we put them into horses,” he suggested. While we may not know how they work, or what they do exactly, stem cells are being used to treat horses for a variety of conditions – typically, this involves suspending the cells in a solution and injecting it directly into the defect. “We know if there is a defect area of inflammation, some kind of signal pathway, the body mobilizes the stem cells that we have and sends them there. But it’s a very slow process and the older we get the less efficient it is,” said Dr. Koenig. Alternatively, a scaffold of some type might be used to retain the stem cells at the injury site. “People have been using fibrin glues and plasma products to try to retain the cells at the injection sites. We are currently working on hydro gels and some novel electrospun scaffolds, but it’s very complex,” said Dr. Koch. “It is becoming increasingly apparent that your material choice has a huge influence on how the cells behave. The topography of your material and the mechanical properties of the scaffold can greatly affect the cells. Also, you have to ensure that there’s enough diffusion of nutrients and waste products in and out of the scaffold so the cells don’t die in the scaffold,” he explained. Techniques aside, researchers are exploring stem cell applications in almost every area of veterinary medicine. 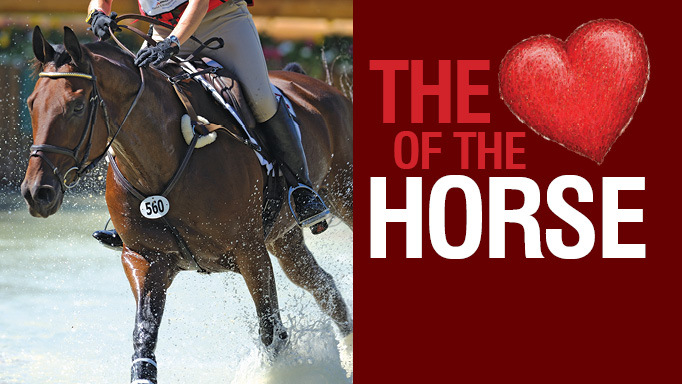 Lameness due to cartilage defects is a major problem in the sporting horse and despite decades of research, the ability to repair cartilage remains elusive. In theory, cartilage could be engineered in the laboratory and used to repair damaged joints. “Maybe over time we can generate a big piece of cartilage that’s almost like a tile that you can then go in and replace and it’s more or less ready to be use. Maybe over time we can find scaffold and cell combinations where you can actually build an artificial biological joint or joint surface that could replace the current metallic joint implants for joint replacement,” said Dr. Koch. It’s science fiction at this point, but researchers are getting closer. “We are making cartilage in the lab. We are working with a hydro gel and trying to combine it with a bone substitute so that we make a tissue engineered construct that is consisting of a boney part and a cartilage part,” said Dr. Koch. The primary focus at this stage, however, is trying to determine which stem cells are best suited to cartilage repair. Dr. Laverty feels that the bone marrow-derived stem cells are the safest. “We are working with iPSCs, but the worry is controlling them in the body and we have to be sure that they stay as cartilage,” she said. 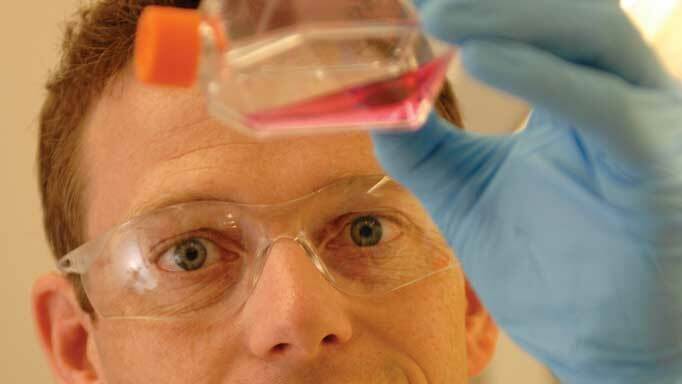 Dr. Koch suspects that cord blood-derived stem cells offer superior results for cartilage repair. “It’s more of an observation at this point. Researchers in Japan and the US reported that cord blood-derived cells in humans had a higher potential to form cartilage than human cells from bone marrow and fat. I used exactly that protocol for the equine two years prior to this report in human medicine. You could almost take it figure for figure and the results were very similar, so it’s possible that my cells truly are a more undifferentiated, more naïve stem cell type,” he asserted. The anti-inflammatory properties of stem cells are generating a great deal of interest, offering new hope for osteoarthritis and tendonitis. “Maybe some of these cells function to secrete factors and have more of a governing role at the injury site – directing other cells to do the work and then they disappear themselves after a while. That might be some of the lower hanging fruit, if you can use these cells to treat conditions that have an inflammatory component, like osteoarthritis,” said Dr. Koch. At least one study suggests that these cells might reduce pain and lameness. “There is a study out that shows that when stem cells are injected into a joint that has severe inflammation, it seems like there is less pain. But that was a very small study and a subjective assessment. It’s just the feeling that the researchers had that the horses were less painful,” said Dr. Koenig. Dr. Laverty is also studying how the inflammatory environment in the joint can change the behaviour of these cells. A new area of interest in stem cell therapy is wound management. “In the case of acute wounds, which can be sutured and don’t dehisce [split open], which isn’t common, when all goes well there will be regeneration of the epithelium. However, the dermal component of skin heals with scar tissue and won’t be as strong as the original tissue, so the scar is susceptible to re-injury,” explained Dr. Christine Théorêt, Director of the Comparative Veterinary Tissue Healing Laboratory, University of Montreal. “When things don’t go well, very often the wound will remain uncovered for a long time and it seems like it enters a chronic stage where something in the wound is not functioning properly. The dermis and the epidermis aren’t talking to each other anymore and it just sort of stagnates,” she said. Currently, skin grafting is the gold standard for wound coverage in veterinary medicine. 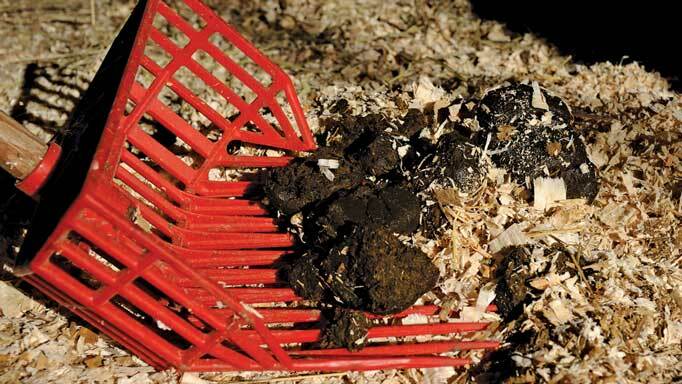 But the process is complicated in horses by the lack of available donor skin, compared to a dog or a cat, and the type of grafts commonly used. Until recently, stem cells offered little hope for wound treatment due to the limitations associated with the more commonly available types of stem cells. Mesenchymal stem cells differentiate into bone, cartilage, and fat, as opposed to skin. Embryonic stem cells are difficult to work with. “For people who are interested in skin regeneration there seem to be fewer options,” said Dr. Théorêt. iPSCs may provide a viable alternative. “If they do have all the virtues attributed to them, then in theory we should be able to grow some stem cells with a limitless self-renewal capacity, and able to change into cells that are of interest in a wound, like a keratinocyte, if it’s the epithelial cover that is missing for instance,” she explained. Dr. Théorêt has started work on pilot studies with equine iPSCs with the aim of forcing these cells to commit to a keratinocyte lineage – a feat that has been accomplished in other species. Eventually, she hopes to create skin equivalents in vitro and graft them onto horses. “We’re expecting that there will be hair follicles, sebaceaous glands and sweat glands and so on, which are absent from usual scar tissue. But we’re a very long way from that. We just barely started working with iPSC to see if we can get them to do something in vitro,” she said. Obviously, there is a great deal of work to be done before stem cell therapy fulfills the promise of its potential, not the least of which involves raising the funds for research and overcoming the ethical issues of live-animal studies. “I feel, unfortunately, in the horse world we’ve been very rapid to go the clinics – to put the cart before the horse. We need to do a lot more work. It is an expensive treatment and if owners really want to know whether it works, or if it doesn’t, we need a lot more science,” said Dr. Laverty. At the same time, there is cause to be hopeful. A great deal of work and research dollars is being invested in stem cell research, particularly in the horse. With time and money, tissue regeneration may be less science fiction and more science. SHOULD YOU STORE CORD BLOOD? “There might still be some rationale and utility in storing cord blood,” said stem cell pioneer Dr. Thomas Koch of the University of Guelph. “We don’t really know. Right now, if people want to isolate and store these cells for possible later use, it’s something we can do. It has to be done with the clear understanding that if you do this you are a first mover. We don’t know the utility of doing it or the usefulness of these cells in the horse. “If you have the money and interest to do it, then do it. But know you may be supporting research more than anything else,” he said. 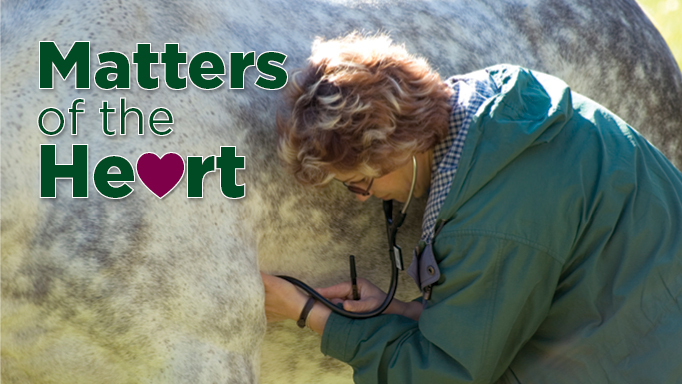 Understanding heart health and heart disease and failure in horses. 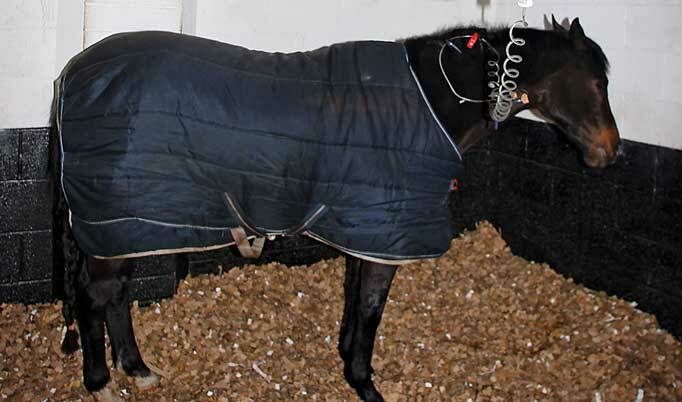 New research is helping us understand more about protecting this vital organ in competitive equines.